United Airlines and Delta are showing flights from Vancouver to Rio de Janeiro, Brazil for $719 CAD roundtrip including taxes. There are also flights from Vancouver to Sao Paulo, Brazil for $777 CAD roundtrip. And flights from Vancouver to Fortaleza, Brazil for $768 CAD roundtrip. Most flights have 2 stops on the way down, with 1 on the way home. There are a *few* dates with 1 stop each way. You can also find similar prices from Victoria (YYJ). - Look for the dates that are $719 to $778 roundtrip. 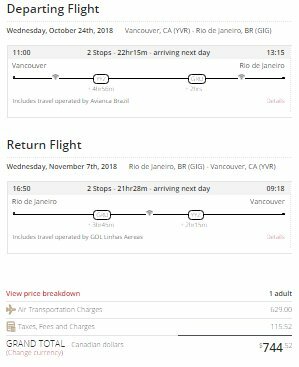 Update 7/19 - Air Canada and partners are now showing flights from Vancouver to Rio de Janeiro and Sao Paulo, Brazil for for $744 to $782 CAD roundtrip. 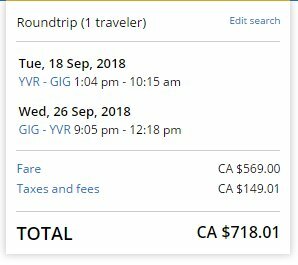 vancouver, yvr, flight deals, air canada, delta, south america, victoria, yyj, united airlines, brazil, sao paulo, sao, gig, rio de janeiro, gru, fortaleza and for. 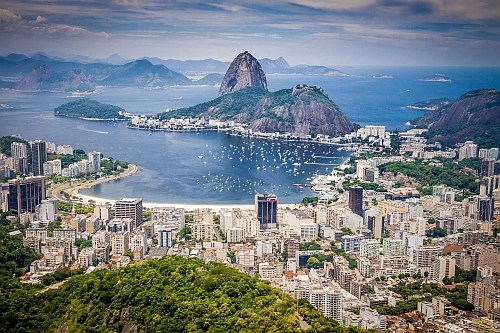 One Response to "Vancouver or Victoria to Rio de Janeiro, Brazil - $719 CAD roundtrip | Sao Paulo for $778"
Great deals how about something for mid March to April? Any deals for this time?